Don't waste your money on products that don't work! 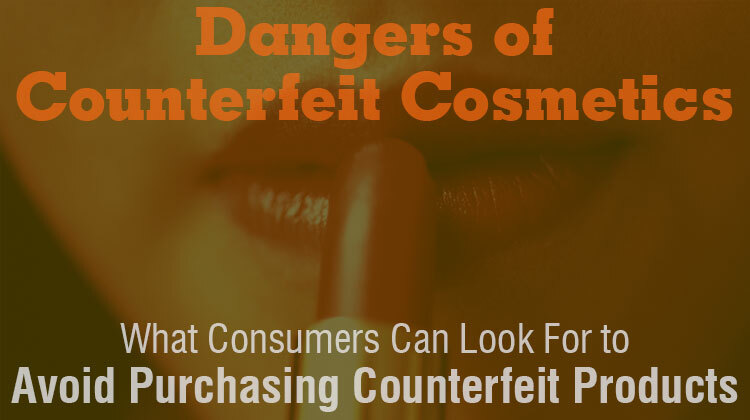 Share the post "Dangers of Counterfeit Cosmetics"
According to the International Chamber of Commerce, each year $250 billion is lost to counterfeit products and this loss is expected to total $1.7 trillion by 2015. Pharmaceuticals and personal care items ranked in the top 5 counterfeited items seized by U.S. customs (refer to table 1 below). The economy isn’t the only thing taking the hit from counterfeiting. Recent studies, including a comparison study conducted by NSF International, have found elevated levels of harmful contaminants such as lead in fake cosmetics. This article provides a few tips that consumers can use to avoid knock-off cosmetic and personal care items, especially when purchasing online. If you have thought about the safety of some personal care products or ingredients, you aren’t alone. A recent independent study conducted on behalf of NSF International found that 48 percent of consumers are concerned about the quality and safety of personal care products. Many major retailers and manufacturers are now taking steps to help ensure the safety and quality of these products and NSF International, a global public health and safety organization, is helping. NSF International developed a program earlier this year that addresses growing concerns among retailers and consumers about adulteration, mislabeling and counterfeiting issues. The program provides extra checks and balances for product quality in the form of manufacturing facility inspections, product testing and certification as well as training for manufacturing and quality personnel. These services enable manufacturers to improve the quality and safety of their products and retailers to strengthen oversight of their cosmetic and personal care suppliers. Why is this important? Cosmetic and personal care manufacturers are required by law to ensure the safety of their products. The U.S. Food and Drug Administration (FDA) regulates cosmetics, requires manufacturers to ensure their products are safe for their intended use, and advises manufacturers to use the necessary testing to ensure the safety of their products and ingredients. What can consumer do to protect themselves? Although these products are regulated, they aren’t approved by the FDA or any other regulatory agency before they hit store shelves. So it’s important to keep a few things in mind when purchasing cosmetics and personal care products. Consumers should purchase cosmetics from trustworthy companies and authorized retailers and be cautious of inexpensive versions of brand name cosmetics. If the price is too good to be true, it probably is. Additionally, consumers who have concerns about the product packaging (e.g. wear/tear, discoloring, missing barcode, etc.) or the product itself can contact the manufacturer and verify that the lot number on the product is legitimate. Fake or knock-off versions may contain harmful levels of contaminants or heavy metals or have imperfections in packaging or in coloring as NSF found in some cosmetic products purchased online. Earlier this year, NSF International evaluated two product types – mascara and compact foundation – each purchased from two different sources: one was authentic and one was counterfeit. Both products were tested and compared to determine differences in formulations, labeling, packaging and levels of heavy metals. NSF International found a high level of lead (260 ppm) in one compact powder. This is 26x the allowable level set by Health Canada for lead in cosmetics. This was also 1000x higher levels of lead found in a comparable compact product. Although an exposure limit for lead in cosmetics intended for skin contact has not been set in the U.S., the CDC recommends that people should minimize their exposure to lead, especially children, adolescents, and pregnant women. During the evaluation, NSF also found key differences in the packaging and formulations for both sets of mascara and compact powder. In the compact powder set, one of the packages had the lot number, bar code and color code printed or stamped directly on the package while the other used stickers for this information. The colors and graphics on the mascara tubes also differed. The lot number was printed on the package of one mascara while a sticker was used to adhere to the lot number to another mascara. Consumers concerned about what’s in their cosmetics can visit www.nsf.org/consumer or contact NSF International’s Consumer Affairs Office at info@nsf.org for more information about how to look for products that are safer for you and your family. Casey Coy has more than 13 years of experience in analytical testing, toxicology, microbiology and molecular biology. As Manager of NSF International’s Cosmetics and Personal Care Program, Casey works with retailers and manufacturers to help ensure the safety, quality and regulatory compliance of cosmetic and personal care manufacturing facilities, ingredients and products. Editorial (op/ed) commentary are the author's personal opinions only, and not necessarily those of other Fact Based Skin Care staff or this publication. The material on this site may not be reproduced, distributed, transmitted, cached or otherwise used, except with the prior written permission of Fact Based Skincare. Copyright © Fact Based Skin Care - All rights reserved.